If you want to keep fit, you’re probably on the lookout for the best equipment for smart fitness training. Every gym needs to have at least a single piece of cardio fitness equipment. A treadmill is the logical choice for most people. A recent research ranked treadmills as the number one fitness machines in the United States. Treadmills may be a big investment, but they definitely pay off in the long run. We can all agree that there’s nothing as disturbing and annoying as noise while working out. Everyone normally looks forward to a quiet workout session where you can put all your focus and concentration to shaping your body and keeping fit. Earphones and workout music may help to some extent, but you may need more than that to stay focused. What is a Smart Treadmill? Enter smart treadmills. Smart treadmills represent an outdoor surface and will provide you with an unrealistic running experience. Besides keeping the amount of noise it produces to a minimum, a smart treadmill has a running deck that absorbs the impact of a run. Thanks to interactive programs, reliable mobile-app connectivity and built-in screens, you will also enjoy extra features such as running along with a virtual partner, tracking stats or watching multimedia files as you run. Before you purchase a treadmill, you should consider factors such as ease of use, ergonomics, brand, user safety, functionality, extra features and your budget. As a general rule of the thumb, the more cash you spend on a treadmill, the more technologically advanced it is. The best smart treadmills sit at the peak of the budgetary scale, but that doesn’t mean that there are no excellent choices to suit less extravagant tastes. What we aim for at the end of this article is to give you a new perception of smart treadmills by offering in-depth reviews of 4 of our top bestselling, highest rated treadmills in multiple price tiers. With breath-taking designs, superior quality and fancy features available, you will love these treadmills. We present to you the best smart treadmills for 2019. Power is the first thing that comes in mind when the Sole Fitness F80 Treadmill is mentioned. This is evident through its silent 3.5 CHP, DC type duty motor that provides a running speed of 12mph with an inclination of up to 15 percent for intensive workouts. It sits at an impressive position #37 at the Amazon Best Sellers Rank in the Sports and Outdoors category – another indication of its prodigy in the game. 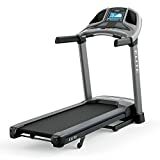 The treadmill comes in a rack-and-pinion gear design, in addition to a 2-ply belt, pulse grip, and a chest strap to monitor the heartbeat rate. Let not its powerful motor fool you. This treadmill is super comfy and enjoyable. It is equipped with a reversible deck whose purpose is to reduce the impact on the joints, and it successfully does this by 40 percent when compared to outdoor training services. Setting up the treadmill should be no trouble. All you need to do is knuckle it down, and you should be able to walk, jog and run at your desired pace. It is worth mentioning that the treadmill comes with a Backlit LCD Console, iPod, and MP3 Compatible System to provide entertainment. Workouts don’t have to be boring. Upbeat music can spice up the environment as you run towards that decent shape. Also, there is a Bluetooth feature that allows you to transfer workout data to your smartphone or any other device and monitor your progress. In addition, the treadmill comes with its workout programs: six standard programs, two custom programs, and two heart programs. Lastly, its warranties against defects are irresistible: lifetime on frame, deck, and motor, five years on electronics and two on labor. Simple to use Touch Display with full-color Touchscreen Console. Displays 3 Different Dashboards. Still Includes Console Buttons for easy changes for speed and incline. includes lifetime on frame and motor; 5 years on equipment parts; 1 year on labor. Customers describe this treadmill as a simple, quiet, durable, reliable and well-built machine. Well, we can’t argue with users who have first-hand experience with this treadmill. We can describe it as a perfect machine that gives you second thoughts about going to the gym. It comes with a quiet 2.75 CHP duty motor and its lifetime warranty should assure you that it will maintain its performance for decades. It has a speed of up to 12mph with an inclination range of 15 percent that provides a high-intensity workout. Beginners could start with a speed of 0.5 mph with pros shooting up for the highest rate. The machine has an iPod/MP3 Compatible System that keeps you pumped up while working out. A Backlit LCD is also present to monitor your workout data. There is also an option of transferring this data to your smartphone, laptop or any other device through a USB Connectivity option. We must give a thumbs-up to the LifeSpan Fitness TR3000i Folding Treadmill’s programs. Their topics vary and teach users on various issues, inclusive of how to monitor your heart rate, healthy living, losing weight and sports training among others. Finally, the treadmill contains a three-speed fan that cools and keeps you going without feeling the heat effect. For computer nerds and work addicts who spend hours behind the screen, a treadmill specifically designed for you is finally here. It comes in a design with a desktop area allowing you to exercise and work simultaneously. The treadmill works with minimal noise to ensure it doesn’t disrupt co-workers and also improve your focus. This explains why it lacks a Compatible Music System – to keep noise down. The treadmill comes with a 2.25 HP duty motor which gears up a speed of up to 4 mph. Another cool feature that you’ll love is that it has two front wheels that allows for easy maneuverability. When it comes to transferring data and monitoring your progress, each treadmill tries to outdo competition by coming up with something new. 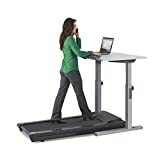 LifeSpan TR120-DT5 Treadmill Desk hasn’t been left out on this. This treadmill comes with Bluetooth integration which allows you to connect it to an App, the Active Trac App. A lot is achievable with this app. The Active Trac App will enable you to monitor your progress and gives a graphical output of aspects such as speed, distance covered, steps made, calories burnt among others. The App is also connected to Facebook and Twitter and lets you share your progress with your friends. Just as the name suggests, the Horizon Fitness Elite T7-02 Treadmill is one of the most elite treadmills in the game. By elite, we mean superior design, quality, and features as compared to its competitors. What are you settling for with this treadmill? Let’s have a look. The treadmill comes with a blue LCD console that displays your progress as you work out. Secondly, the machine comes with a 2.75 CHP Motor having a maximum speed of 12mph and an inclination range of up to 15%. This enhances your metabolic rate and assists to build your muscles. Furthermore, the treadmill is equipped with 40 work-out programs specifically targeting your rate of burning calories and performance. The Horizon Treadmill has shown its competitors dust when it comes to entertainment. Where others use Bluetooth, USB Cables and Apps to connect and transfer data to smartphones and laptops, this has gone a mile forward in respect to this. The treadmill features a passport video which allows you to connect your treadmill to a TV screen over Wi-Fi. The video is of super quality that enables you to view beautiful images and sceneries. The video is programmed with the treadmill to change as you continue running. The images change and give you a virtual feeling that you are running in those places. Another selling point of this treadmill is its accessories. It ships with 2 large speakers and a music port that supports MP3 and iPod. The treadmill comes at a reasonable price, and we assure you that every dime spent on it is worth it! There we go, those are our top 4 choices for smart treadmills. Your safety should come first when using these machines, that’s we only included the crème de la crème. 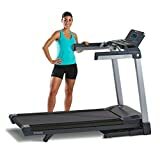 All the treadmills in our list are available on Amazon.com for purchase and shipping. Start your fitness journey today by purchasing a smart treadmill that addresses your needs!